Back when this 1970 Chevrolet Caprice was new, you couldn’t drive more than a block without seeing a full-sized Chevy in someone’s driveway. 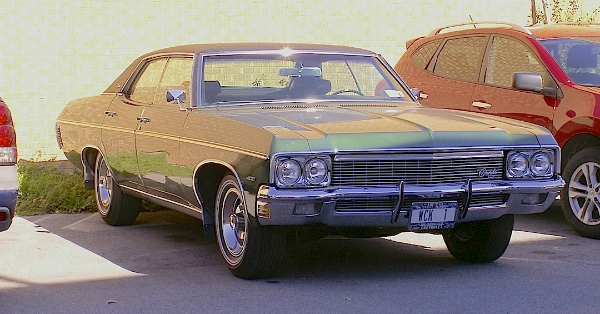 The Caprice sat on the top rung of the big Chevy ladder back in 1970, just above the venerable Impala. It was GM’s answer to the Ford LTD, which offered luxury car features at popular car prices. This may be what eventually did in the Pontiac and Oldsmobile (and Mercury) nameplates. Why spend extra bucks for one of those when the less-expensive Chevy (and Ford) offered many of the same amenities? This green four-door, with its 400 CID V-8, was seen a while back in Newfane. Jim Corbran, RRofWNY …and check out our Facebook page: Non-American Classic Cars The post RealRides Of WNY appeared first on Buffalo Cars.